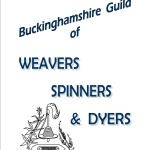 The Buckinghamshire Guild of Weavers, Spinners and Dyers is one of the founding guilds of the Association of Weavers, Spinners & Dyers and was formed in 1954 to promote, share and enjoy our three crafts. Our meetings will consist of an outside speaker relating to one of our three crafts, or a members’ meeting where we show our work, and exchange our own knowledge and experience. There will also be the occasional workshop. The current cost for annual membership is £20.00 (up to and including December 2019) with no additional charge for members attending meetings. Non-members are charged £5.00 each per meeting whether it be all day or for just part of the day. Membership is open to anyone who shares our interest in the textile crafts. No experience necessary. If you have an interest in spinning, weaving and dyeing and/or would like to know more about the guild’s activities, please don’t hesitate to contact the Guild Secretary at the email address given in the top right hand corner of the screen. If attending the afternoon session (which starts from 2.00pm, we would be grateful if you could arrive from 1.30pm for a 2.00pm start, after the announcements from the Chair from 1.45pm. FACILITIES: Free Parking. The new one way entrance to the parking is from Banks Road (for those of you with satnav, check as it could send you down Crossways!). Various competitions will run throughout the year, one of which will be a specific craft competition for each of the four quarters – 1 – Spinning, 2 – Weaving, 3 – Dyeing and 4 – Christmas themed. The aim being to help members/visitors think about our crafts in a new way, see what others do and generally get everyone inspired! There is no obligation to take part in any of these – but we’d love your input and ideas on them. 19 May 2019 Nb: Meeting will be 12.30pm - 4.00pm Presentation/workshop by Helen Munday (Guild member) Helen Munday will be talking to us about her sketchbooks and journey from inspiration to finished item. She will also bring material with her so that we can all try out various sketchbook techniques. 20 October 2019 Romilly Swann. "Colourful Skeins"